“I want people everywhere to know that nothing is impossible for God,” Uriel said. The National University of Mexico is the oldest university in North America. It was founded in 1551 by Charles V, the Holy Roman Emperor. The Chihuahua, the smallest breed of dog in the world, is named after a Mexican state. Spanish conquerors introduced bullfighting to Mexico. Plaza Mexico in Mexico City is the largest bullring in the world, with more than 41,000 seats. Artists in the country can pay their taxes using artwork. Mexico City has the biggest number of museums in the world. To Sabbath School teachers: This story is for Sabbath, March 3. Click here for photos to share while telling the mission story. When Uriel was six months old, the doctor diagnosed him with hyperthyroidism, a disorder that caused him to feel tired all the time. A few years later, Uriel developed an illness that made his leg muscles hurt dreadfully. Because of this illness, his feet grew in the wrong direction, and he could barely walk. Uriel had to wear special shoes to correct his feet. If this wasn’t bad enough, the doctor then found a tumor in his brain. But the doctor didn’t want to operate on the tumor because he was worried that Uriel would grow worse. Uriel went to the hospital many times with his mother and grandmother, but nothing could be done to stop the pain. Mother felt sorry for Uriel. Grandmother felt sorry for Uriel. The doctor felt sorry for Uriel. The hospital in Uriel’s town was too small to carry out the operation, so Uriel had to travel two days by car to a bigger hospital in another Mexican state. Mother and Grandmother went with him. Two days before the operation, Grandmother told Uriel’s mother to pray. Then the doctor announced that if he was going to operate on Uriel’s legs, he might as well try to remove the tumor from his brain as well. The night before the operation, Mother went with Grandmother to church for prayer meeting. Mother told the church members about Uriel, and they prayed for the boy. The next morning was the day of the big operation. When the doctor checked Uriel’s legs one last time, he couldn’t believe what he saw. Uriel’s legs and feet were in the right position, and he could walk just fine. The doctor was shocked. He thought someone had made a mistake in ordering the operation. He ordered an X-ray, and the results showed nothing was wrong with Uriel’s legs. The doctor still couldn’t believe it, so he ordered a second X-ray. Again, the results showed that Uriel’s legs were fine. The doctor then sent the boy for a brain scan. The tumor was gone. Everyone in the hospital was shocked. They had never seen anything like this before. The doctor canceled Uriel’s operations. After returning home, Uriel and his mother wanted to learn more about God, and they started studying the Bible with an Adventist pastor. A year later, both Uriel and Mother were baptized. 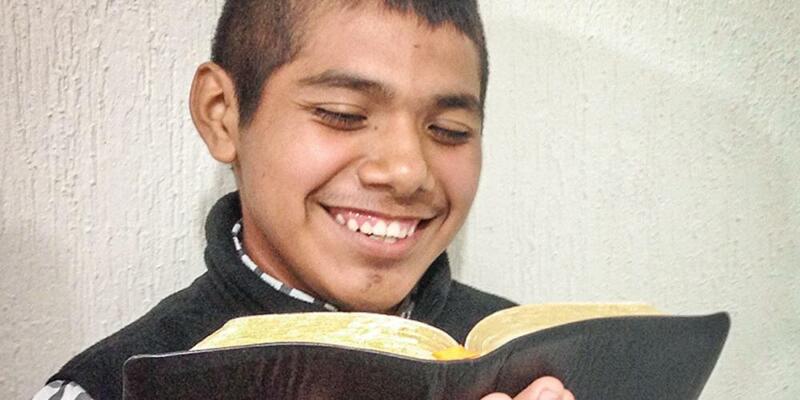 Now, Uriel is a 15-year-old high school student who runs and plays soccer. “I praise God and gave Him thanks because I couldn’t play sports or even walk before this miracle,” he said. Uriel also gives Bible studies and preaches in church. Five people have been baptized through his Bible studies. Part of this quarter’s Thirteenth Sabbath Offering will help a Seventh-day Adventist hospital near Uriel’s home build a new health center so it can assist many children and parents. Thank you for your mission offering.